Hiking Tours in Napa Valley - Napa Native Tours - Wine country tours, excursions, experiences and artisanal products. 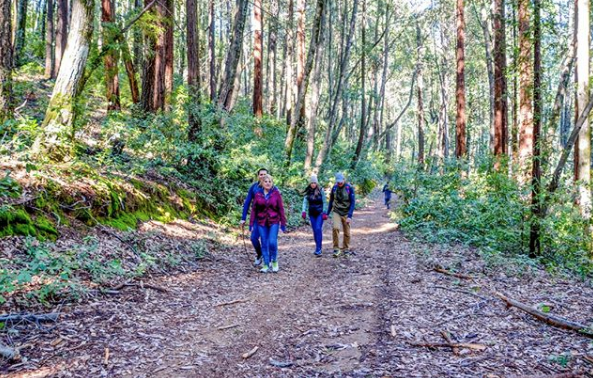 As Napa Valley has become a world renown grape growing, wine making mecca, us locals are raving about the hiking trails in the mountains that surround the valley. Its a well kept secret that Napa Valley has some of the best in the Bay Area. With our tour, we cut the commercial, "pay your fee to the park ranger" parks and take you to where the actual locals like to hike. You'll enjoy mixed pine forests, redwoods and several oak trees during the experience. In the spring, you may even cross a few streams. We have two options to start with and then during the booking process we further refine the experience by picking the trail that fits your groups preferences. Our half day tour is usually about 3 hours from pick up, to drop off. Our full day is closer to 6 hours and includes lunch. Every tour is catered to that specific group, so we can accommodate any skill level. On occasion we combine small groups of like minded people. Since hiking is such a personal thing, we ask your hiking experience during booking so that we can match you with the perfect trail. Waters and an Ice chest are brought on every tour and your guide will have waters for easy access. We also bring a DSLR set up and capture the hike, so we can send you the photos to share on social media. ​Want to add food and wine to this experience? Try our Wine & Wellness package!